With all the jargon, acronyms, and tech-talk surrounding web development we know things can get confusing at times. At Up & Running we strive to demystify the process and make it easy to achieve a professional web presence. This attitude is present in everything we do and even in the language we use. While it’s more accurate to say we “develop” websites, we often opt for the verb “build”. It has a nice hands-on feel that reflects the craft we like to put into every project. Further, we’ve developed an ongoing metaphor surrounding the web development process: Designing a website is like building a house. Think of hosting as the equivalent of your home lot. Hosting is the digital acreage that your website is built upon. Just as every new home construction needs a plot of land to lay the cornerstone, every website needs a solid hosting plan. At Up & Running set up and configure your hosting package so you know your project is on solid ground. A domain name is the “www” address associated with your website. This is street and house number where the world where the world can find your new digital home. We can help select and register the new .com .net or .anything where your new site will reside. 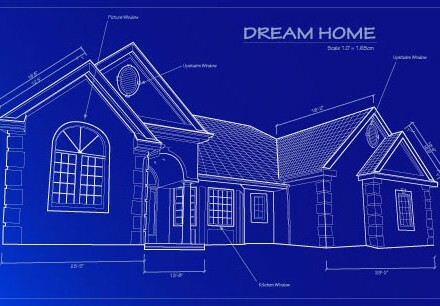 Like your dream home, an impressive results-driven website starts with solid planning. To get there your input is the most important. Through the initial proposal process we are able to draft a master blueprint together. Like a perfect home floorplan, we want to optimize the website in a way that is customized with your unique business, objectives, and clients in mind. There are lots of different methods for constructing a home, from stick framing to modular to brick and mortar. Likewise there are many platforms to choose from when building a website. At Up & Running we utilize the WordPress platform – one of the most popular and well-supported platforms in the world. WordPress offers the best in customization, functionality, and adaptability. Further when it’s time to add that addition, WordPress is highly scalable, meaning updates and site expansion are done easily. The walls are up and now it’s time to select the wallpaper, the light fixtures, and even the accent rug. With interior decorating and website design, it’s all about the details. Our websites are custom designed to serves as a visual and thematic touchstone for your business, leading to a more cohesive brand. Think of your products/services as pieces of fine art hanging in frames above the mantle. Every property needs upkeep. The yard needs to be mowed, the porch needs to be swept, and the garage occasionally needs a new touch of paint. The same is true with a new website to keep it attractive and inviting. We have options. Maybe you like to get your hands dirty and mow your own lawn? With our WordPress training for you and your staff, it’s like giving you the keys to a high powered riding lawn mower. We also understand you might be too busy or not interested in painting the garage. We offer a range of convenient service packages that keep your home the best on the block and the envy of all your neighbors. So, maybe we’ve stretched this metaphor too far. The point is that achieving a world class web presence for your business or entity can be a straightforward process. Laying the cornerstone is as simple as giving us a call. We have our digital tool belts all cinched up and are ready to start swinging hammers.